Since the last rampant spread of the H1N1 virus, I’ve been carrying a hand sanitizer in my bag. The truth is, I hardly use it as a hand sanitizer as I usually wash my hands at the sink. However, I have found some other useful ways for the hand sanitizer. 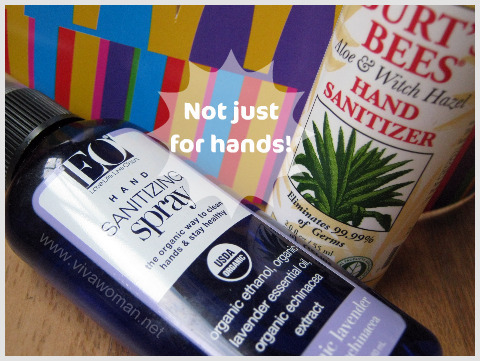 I use Burt’s Bees’ Aloe & Witch Hazel Hand Sanitizer in spray form. It contains 60% Ethyl Alcohol and some natural fragrance. The scent is very refreshing and I like the smell whenever I get to use it. However, I don’t use it on my hands as often as I spray it in the air. It started when I walked into an elevator with a disagreeable odor and I whipped out this bottle to spray around the empty elevator in desperation. It worked great as the scent from the hand sanitizer managed to mask the overwhelming stench. So from then on, I use this as an air freshener whenever I have to. On occasions, I find myself having to help my son in the public toilets with his “big business”. But you know how the seats in those toilets are; I could never trust the level of hygiene. So I started using the hand sanitizer as a toilet seat wipe. Those sanitizing wipes are easier to use of course but with my spray bottle, all I need to do is to spray a generous amount on the toilet seat and then tissue off before having my son sit on the throne. Okay, this is good for those who are paranoid about hygiene. I rarely use the sanitizer for this purpose but it is something useful when traveling if cleanliness is an issue at certain public places. This is a bit embarrassing but I forgot to bring any deodorant during a getaway and the closest I could find in my stash was the hand sanitizer. Since it contained alcohol, I figured it can get rid of those odor causing germs. It did help to some extent; a desperate measure to keep the dogs from sniffing at my underarms at least. How many times have you heard or read that your cell phone screen is a breeding ground for bacteria? This means that using it could potentially dirty the side of your face. For those who are acne prone, this isn’t great news. Well, whip out that hand sanitizer and spray it on your cell phone screen, then give the screen a good wipe! And you can do it as often as you wish! For those who use use eye or sunglasses, hand sanitizer is great for times when you need to clean them. Spray, wipe and your glasses will sparkle in no time! And you have no more specks or spots to distract your focus now. As you can see, hand sanitizers are quite useful, and can serve you in a few different ways. And in certain cases, it befits the saying “desperate times call for desperate measures”! I must get one to sanitize public toilet seats. Its amazing, how dirty the seats can be. Oh geez…yes, scary. I keep my bottom far away from the seats. Sanitizing public toilet seats! Why haven’t i thought of it?!! Thank you for the tip. That’ll come in real handy when my kids need to visit the public toilet. Yes, very useful. I wouldn’t have discovered this tip if not for my son. Wow, the trolley…good idea! Funny thing is I rarely use the hand sanitizer for my own hands. i tried to buy the keys sunscreen from amazon as you recommended on your review post, but the price was about usd27 instead of around usd20. http://www.vivawoman.net/2010/01/14/sweetsation-therapy-moisturizer-with-spf30/. They have since change their name but their formulation is not bad. thanks so much for your quick reply and your recommendation! 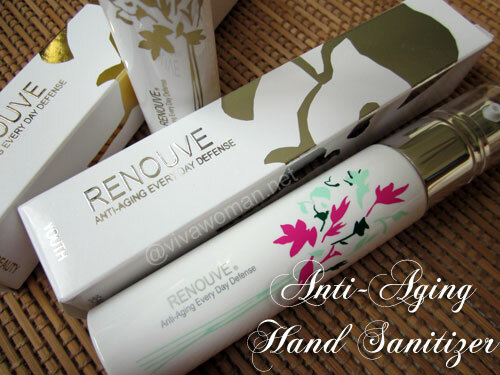 i’ve ordered the samples just to try out, cos the ingredient list looks really long and my skin is quite sensitive. however, i’m looking more towards finding a good sunscreen, not a moisturiser with spf, as i think one doesn’t use the appropriate 20-cent coin amount if it’s a moisturiser. Yes, that was my concern too…but it turned out quite good and I rather like the product. My favorite of course is still Marie Veronique Organic’s. But it too is a moisturizer with SPF. I can use about 1/4 of a tsp with that but my face would look whiter of course. In Singapore, only Isetan at Scott & ION Orchard has toilet seats sanitizers. I always carry a pack or two of wetwipes with me so I can use them to wipe the toilet seats. I never knew about those toilets having seat sanitizers. im definitely with you on the toilet seats. i never used to care, until my friend told me that a family friend of hers actually contracted an infection from a public toilet. since then, i have either waited until i was safe at home or i sanitized the seat like crazy! i like the sound of the burt’s bees sanitizer, ill look for it next time! We have it at Sephora here. I like the smell a lot! i never think of sanitizing the toilet seat as the only best i can do is to wipe the seat with the tissue. This is really a great idea for a safe seat. Will get it tomo. Personally, I hate seeing ppl so inconsiderate to just leave any stain as if their “trophy” on the toilet seat and just pretend ‘it’s the next user problem now’. I always make it a point to check if it’s clean before I leave. Ya, I know what you mean by stains. But I still consider those without stains unsafe. Feel that they’re full of germs. 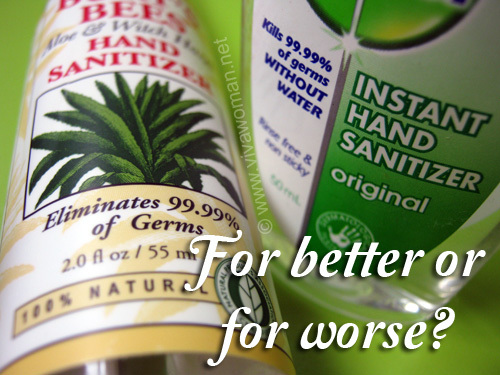 These are such great ideas for using hand sanitizers. I always line public toilet seats with tissue paper before I seat on it; but I guess now, I’ll also make sure I use the sanitizer. Thanks for the tips. Toilet cleaner is very important issue for our daily needs.Natural cleaning product is perfect for for kitchen, bathroom and also floor cleaning. Toilet cleaner is a very important issue for our daily needs. Peesafe is one of the best toilet cleaner.